For the PlayStation 3 compilation of PSP games, see God of War: Origins Collection. 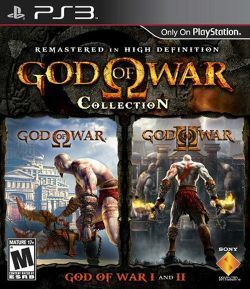 God of War Collection is a remastered port of God of War and God of War II for the PlayStation 3 on a single Blu-ray Disc, and was released in North America on November 17, 2009. On December 17, 2009 on the European PlayStation Blog, it was announced that God of War Collection would be included in the God of War III: Ultimate Trilogy Edition. This "Ultimate Trilogy Edition" was released in limited quantities at the same time as the main God of War III launch on March 19, 2010 in Europe, and on March 18, 2010 in Australia and New Zealand. There have been no announcements about God of War Collection being released as a standalone product in Europe, except in the UK. The UK release date for the God of War Collection and trilogy packs has been set as April 30, 2010 with several online retailers pre-ordering to this date. It is also scheduled for release in Australia on April 29, 2010. The game was released in Japan as a standalone on March 18, 2010 and was published by Capcom who has published the other God of War games released in Japan. It was also released in Japan in a special God of War III Trilogy edition, which includes God of War III and God of War Collection. The "Trilogy Edition" released at the same time as the main God of War III launch in Japan which was March 25, 2010. Top: original God of War. Bottom: God of War Collection. The games were ported by Bluepoint Games and use the features of the PlayStation 3, including high-definition resolutions (720p), anti-aliased graphics locked in at 60 frames per second and trophies. 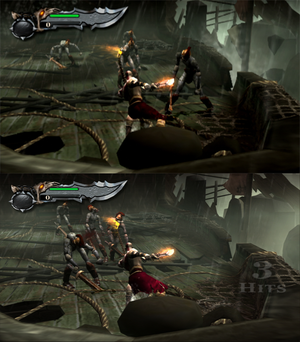 The port was derived from feedback of fans of the series in anticipation for God of War III's release, and was seen as a way to introduce new players to the series prior to that game's release. In a PlayStation Blog post on September 23, 2009, it was revealed that the God of War III game demo from E3 2009 is included. From November 24, 2009, the God of War team began a sweepstakes in celebration of the release of God of War Collection. There was one grand prize of this sweepstakes, an autographed "Gold" disc (A first pressing of the game created when the assets were finalized and reached "Gold" status. These copies rarely reach the public. ), exclusive artwork created and signed by a God of War team member, a Limited Edition Kratos T-shirt, and a never before released Limited Edition 10" Figurine of Kratos. First place prize was a copy of God of War Collection signed by the development team. The winners were announced on the PlayStation Blog and on God of War.com on December 24, 2009. This page was last edited on 25 January 2013, at 05:32.